Leopold's Crate: the Star Spinner toy for dogs: good for slowing down fast eaters! the Star Spinner toy for dogs: good for slowing down fast eaters! I’m always looking for new toys to help keep my dogs’ minds active. I recently tried a toy called a Star Spinner Dog Toy Puzzle. What is the Star Spinner? 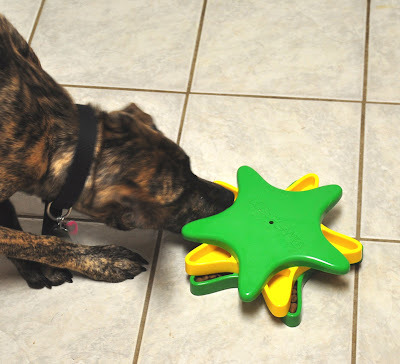 The Star Spinner is a toy that is advertised as “a brain workout for your dogs”. It has two star-shaped levels of five chambers on each level. 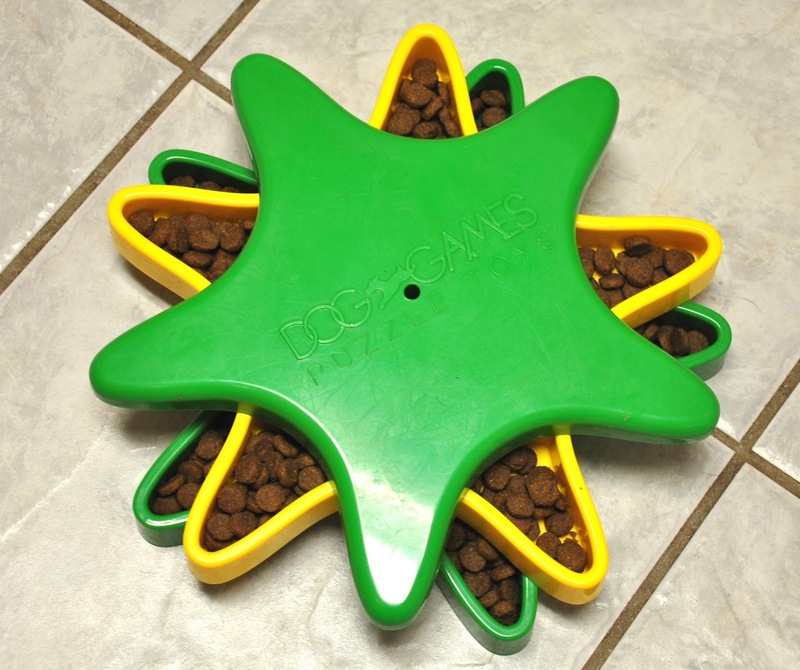 The levels spin, the idea being that the dog has to work spin the levels to expose treats or food that you put inside the chambers. Difficulty can be changed by tightening the spinning mechanism so that it’s harder to make the levels spin. I’ve been using it for Halo at meal time. I fill the chambers with her kibble and let her go at it. My opinion of this toy. In terms of mentally stimulating a dog, this toy is on the right track, but I don’t actually think it does a good job of keeping a dog mentally entertained for any length of time. It’s way too easy to figure out. In terms of difficulty, the instructions say “Continue to challenge your dog by adding more treats inside more chambers”. I do not agree with this. The makers also tried to give the toy different levels of difficulty w/ the tightening mechanism, which is a good design element, but it doesn’t actually make the game more mentally challenging. It makes it more physically challenging, encouraging the dog to scratch at the toy more. It’s the overall design that makes this puzzle too easy. As soon as the chambers are revealed on a level, they’re all revealed and the game is over for that level. There are only two levels, so the game ends quickly. Halo, who really isn’t the sharpest knife in the drawer, figured out this puzzle very quickly. It only takes her a couple of minutes, even on the “difficult” setting, to get at all of her food. I think it would be better if some of the chambers became covered at the same time as some of the chambers were opened. I also wish it had at least one more level, maybe even two. Additionally, I wish it was a domestic product (it’s made in China and I prefer to buy domestic products if I can). I think this toy has a good foundational idea, but the design needs some work if they want to be able to honestly advertise it as “a brain workout for your dogs”. A good use for this toy. While I don’t think this toy is particularly successful at being a mentally-stimulating toy, I do think it does a good job of slowing down a dog that tends to almost inhale their food because they’re eating so fast. Halo scarfs her food down as quickly as possible, and this toy did a good job of slowing down her eating a bit.